dl-wx is graphical native client to the DL web-service. With dl-wx your users can create tickets directly from the system’s tray, without having to open a browser or login every time. It’s included starting from DL 0.10 into client/dl-wx in the source distribution. This page contains pre-packaged versions for the most popular operating systems that can be readily installed by your users. dl-wx 0.18 (win32): Windows 32bit. dl-wx 0.11 (win32): Windows 32bit. dl-wx 0.10 (win32): Windows 32bit. “REST URL” is normally the URL of the service with “/rest.php” appended (but ask your system administrator for confirmation). 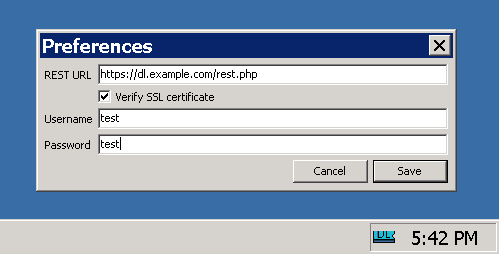 “Verify SSL certificate” can be unchecked to disable SSL certificate validation. This is mostly useful for self-signed certificates, and thus should normally be left checked (the default). Once completed, simply press the “Copy” button to copy the ticket link to the clipboard. You can paste the link anywhere by pressing with the usual “Ctrl+V” (or by right-click / Paste). Please note: You can simply left click on the tray icon to create a ticket with the default settings, which is even faster! 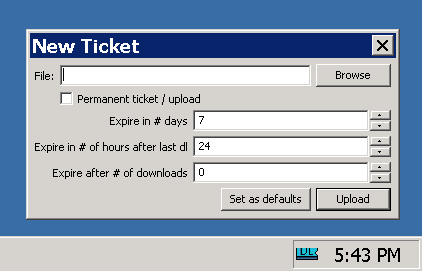 The default settings can be set while creating a ticket normally through the menu. Sometimes the file selection dialog appears under the other windows. dl-wx is still beta-quality software. Not all functions currently available in the web interface can be performed natively. Read the Advanced upload parameters‘s guide for a more in-depth explaination of expiration parameters. The README contains extra details about both dl-wx and dl-cli (the command line client). See General/support mailing list for any additional doubt.